4Life's brand-new RioVida Tri-FactorBeverage formula’s got real punch. Riovida is the only beverage in the world that provides the benefits of NanoFactors, 4Life's patent-pending extract of immune-enhancing NanoFactors®. NanoFactors radically increase the effectiveness of Riovida so you get way more "bang for your buck!" Only RioVida gives the immune support of 4Life's® Transfer Factors and the energizing effects and the antioxidants contained in the amazing Açaí (ah-sigh-ee) berry, the Brazilian berries that vitalize with over 120 antioxidants. Plus powerful antioxidant "black" fruits like pomegranates, blueberries, elderberries and purple grapes! Compare the difference in the chart below. It shows the results of a study conducted by Jeunesse Inc., Institute of Longevity Medicine. The study examined the ability of nutrients to increase the effectiveness of the immune system. 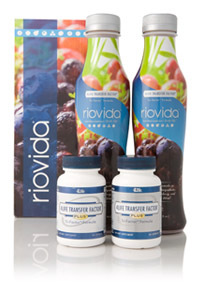 196 of the world's most popular nutrients were tested along with 4Life Research's Transfer Factor products. Quite frankly, the results were staggering!